Google relaxed the strict naming policy for Google+ users and will allow nicknames and pseudonyms on the social network. The new naming policy, announced by Google’s Bradley Horowitz on Google+, will start rolling out this week and allows users to choose alternatives names, be it nicknames or names in non-Romanized languages. But there’s a caveat. 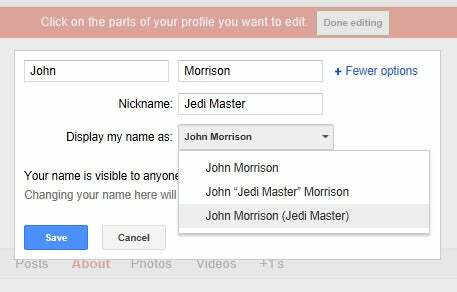 Even if you add a pseudonym to your Google + account, such as "Jedi Master", people will still see your "real name" adjacent to your nickname (see image below). Much to the chagrin of human rights activists, who have argued it should be easier for Google+ users to protect their true identities, Google does not let you with its move Tuesday. Since its beginnings seven months ago, Google+ took Facebook’s strategy to use real names to the next level. To enforce the use of real names on the social network, Google disabled users accounts that did not use their (purportedly) real identity. At first, Google was criticized for disabling accounts without notice, and later began sending warnings to address the problem to users infringing the naming policy. But Google found that 60 percent of Google+ users (now more than 90 million) want to be able to add a nickname to their identity, while another 20 percent simply prefer to use a pseudonym or another unconventional name. As with Facebook, Google also found some 20 percent of signups are businesses that try to create a profile instead of a page. A Google+ nickname or pseudonym does not mean your full name won’t be displayed on the social network anymore. If you choose an alternate name, it will be added to your real name registered with the account. For example, if John Doe wants to use the "DUDE" nickname, the name will be displayed as either; John “DUDE” Doe or John Doe (DUDE). You can’t just have the nickname displayed. To add a nickname, go to Edit profile, select your name and click on More options. The good news though is that Google will allow established pseudonyms, such as Madonna, as long as users provide proof to confirm their identity. This may include references in news articles or scanned official documentations, such as a driver’s license. Google will also accept as proof an established identity online with a meaningful following, but it’s unclear how sizeable this following would have to be. “This seems like a reasonable compromise: all the joys of pseudonymity, without any of the unpleasantness that comes with anonymity,” a Google+ user commented on Horrowitz’s announcement, but most users seem to remain unsatisfied with the change.